As you have gathered from my other posts I’m a huge advocate for testing other family member’s DNA. In fact, at the present time, I’m either the admin or collaborator on over 30 kits. I always tell my children you’re not getting an inheritance you’re getting a lot of genealogy and DNA information. When I speak with people about DNA they often asked do I need to have my siblings tested? I say absolutely and I’ll tell you why. First, let’s go over some of the DNA basics. The test I’m speaking about is autosomal DNA which is the test that AncestryDNA, Family Tree DNA (Family Finder), MyHeritage, 23andMe and LivingDNA is providing. We each get DNA from our parents; 50% from mom and 50% from Dad. But as children, we don’t get exactly the same DNA combination. See the chart below. As I hope my diagram depicts, we each get a different piece from our parents. So I may share some DNA with one brother but not all the same as the other. They may share some DNA that I didn’t get and there are cases where each of us may have got DNA that neither of the others got. So when I look at the number of cousin matches I see that Craig (Brother #1) has 349 4th cousins or closer and I show 437 4th cousin or closer. This doesn’t mean that Craig doesn’t have those matches; he may have some of them. He may not have gotten as much DNA as I did, so some may have fallen into a 5th cousin match or he may not have gotten them at all. One of the things that I like about AncestryDNA is their shared ancestor hints. You get a “shared ancestor hint” when you’ve attached your DNA to your genealogical tree and your match has that same ancestor on their tree. So I’ve linked mine and Craig’sDNA to my tree. So one of the things I had noticed when my brother; Craig tested a few years ago is that he had a few matches that I wasn’t getting the “shared ancestor hints” on. In fact, he had three that I didn’t have. 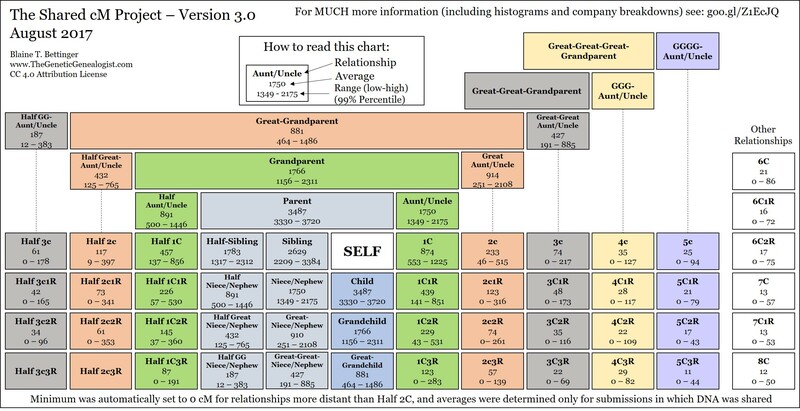 One to a person connected through 2nd great-grandparents (Heinerich Theodor Kottmann & Wilamenea Katarina Luxenburg), one to 3rd great-grandparents (William Vincent & Jane Frampton) and two to 6th great-grandparents (Samual Ridsdale & Ann Smoulton). What makes this cool is I may have been able to figure out the 2nd and 3rd great-grandparent connection because these matches were still DNA matches to me, but I probably wouldn’t have looked at Craig’s 6th great-grandparent connect because he shows as a 5-8th cousin match for 11 cM and I don’t have that match at all. Currently, there are too many matches to worry about folks with that little DNA in common with the family. But AncestryDNA’s algorithms did all the work at understanding the connection. Does this mean that for sure these are the correct most common ancestor? Well before I can come to that conclusion I’ll have to have a closer look at the cousin match’s tree and see if it’s accurate and sourced and confirm there are no other possible relationships. In the case of the relationship of 4th cousin 3x removed 11cM falls into the range for the Blaine Bettinger shared cM project. But as I said I wouldn’t have necessarily looked at this distant a cousin. So all this got me thinking that I really needed to get my brother; Ted (Brother #2) tested. After all, he might have a missing connection to break down one of the brick walls. So when we got together earlier this summer I asked him if he’d test for me and he agreed. This past weekend his results came. I’d attached his DNA kit to my tree so it didn’t take long for the Ancestry algorithms to start working. So my brother has 16 “shared ancestor hints”, I have 12 and Craig has 13. So is there anything new? Well, we now have 1 additional connection to 2nd great-grandfather; Heinerich Kottmann and Ted also has a connection to the DNA match to our 3rd great-grandfather; Thomas Murphy (see Harriet Murphy Has Parents blog). These additional matches to the same ancestor give me more trust that the trees and the DNA are confirming each other. But again we’ll have to confirm the trees. Is this earth-shattering.? I guess that remains to be seen. But just from this very early look into his DNA, I see that in the case of our Murphy line where I had no others in commons with my match my brother Ted’s match has 6 people. Six people that I can possibly connect to and see if they know more of the Murphy story. One thing for sure is there are more matches to look at and you never know what new pieces of the puzzle you’ll find. I have seen so many online conversations wondering why brother’s percentages and matches are different than the OP’s. I say it is a great opportunity to find more matches because brother has a slightly (or vastly) different packet of DNA so it can confirm some matches and can bring in different matches. Great post! Unfortunately, being an only child I don’t have any siblings to test. As a female I hope to find a male relative on my paternal line to take the YDNA test. As my father only had sisters I’ll have to find a male descendant of one of his four older half-brothers who were all born in the late 1800s or a male descendant of my paternal great-uncle. Two of my father’s older half-brothers had no children, another had only a daughter, and that leaves the eldest half-brother who was born in 1885 and died in 1956. He had four children and two sons and so far I’ve found one grandson who was born in 1911 and died in 1994. Now, if I can find a living male descendant who will be tested. My paternal great-uncle also had four children and two sons. Only the older son who was born in 1887 and died in 1970 had children. Fortunately, he had sons but the only one I’ve been able to locate is deceased. He was born in 1916 and died in 1979. Still looking for a living male descendant who will be tested. Yes it can become quite complicated when you are looking for someone to test to confirm a particular line. Hope you find someone. Which test shows the Paternal DNA? The YDNA is the test you’re looking for for your paternal line. This will provide your male line.. so your father’s father’s father…etc. YDNA can only be done by a male so if you are interested in your father’s line you’d have to have either your brother or one of your father’s brother’s test if your father is no longer alive.